Avi Astor is a Ramón y Cajal Fellow with the Research Group on the Sociology of Religion (ISOR) in the Department of Sociology at the Universitat Autònoma de Barcelona. He researches a variety of topics related to religion, culture, and identity in contemporary Spain. His work has appeared in several prominent journals, including Theory and Society, The International Migration Review, The Journal of Ethnic and Migration Studies, and The Journal for the Scientific Study of Religion. Following Spain’s democratic transition during the late 1970s, political and business elites strategically exploited Spain’s rich Islamic heritage in order to further projects of national redefinition, tourist promotion, and urban revitalization. Large and ornate mosques were built in several Spanish regions, and the State granted Muslim communities an extensive array of rights and privileges that was arguably without parallel in Europe. Toward the onset of the 21st century, however, tensions surrounding Islam’s growing presence in Spain became increasingly common, especially in the northeastern region of Catalonia. These tensions centered largely around the presence, or proposed establishment, of mosques in Barcelona and its greater metropolitan area. This book examines how Islam went from being an aspect of Spain’s national heritage to be recovered and commemorated to a pressing social problem to be managed and controlled. It traces the events and developments that gave rise to this transformation, the diverse actors involved in the process, and the manner in which disputes over Muslim incorporation have become entangled with deeply-divisive debates over church–state relations and territorial autonomy. 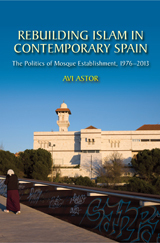 The core of Rebuilding Islam in Contemporary Spain centers on the shifting political and social dynamics surrounding the establishment of mosques, and the question of why anti-mosque mobilizations have been more prevalent and intense in Catalonia than other Spanish regions.